Here we have some household LED lights, LED strips, converters and power units. We even have flasher units and wireless controllers. A selection of various types of LED bulbs in different shades of white (warm white or white), with different fittings and with different power ratings. We will add our own Lux figures, purely as a method to compare one bulb with another - not to be confused with quoted manufacturers Lumen figures. GU10 240V LED spotlights and SMD units with different power ratings (Watts or/and Lux) and different shades of white. Some have glass front overs and some do not. All are thoroughly tested before being sold using PAT testing equipment and other diagnostic equipment. LED SMD units have a wider angle of illumination, approximately 120°. LED Light units have a narrower illumination angle of approximately 90°. E14 & E27 240V screw thread LED bulbs with different power ratings and different shades of white. 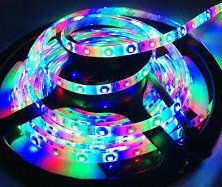 12V SMD LED strip lights with different colors, different shades of white and some with remote controls. We will also be supplying (if required) 12V power supply units. All wattage values are provided by manufacturers and then checked for actual power used. Lux values will be added later with figures gained while using our own test equipment. Not to be confused with quoted Lumen figures by the manufacturer. LED SMD UNIT = Surface Mounted Device (the diodes). LED light unit = Light unit with LED spotlights. E14 (14mm) are the smaller screw threads. E27 (27mm) are the larger screw threads. B22 or BC are the standard UK bayonet fitting. These come on a 5M roll and are very easy to install. They have an adhesive backing, but we also have plastic clips as well, they come with an adapter plug and are then powered by a 12V mains transformer type plug. They could be wired permanently through a transformer and routed in the same way as any other 12V household bulb. LED diodes per Meter = There are 60 x LEDs per meter and are non-water proof, unless specified. Various fittings and adapters - there are also remote control units and transformers. We will try and stock other types of converters/adapters, if requested.